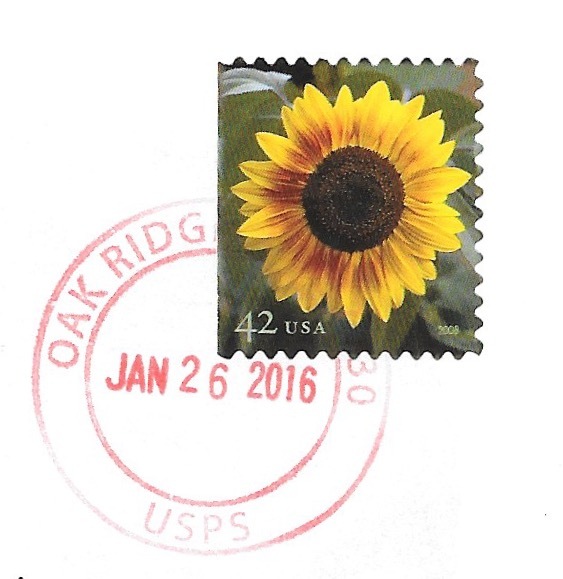 Back in 2008 2016 I received a letter posted with this 42c sunflower stamp issued in 2008, when the rate was 49c. I'm not sure how it made it to me without the insufficient postage being requested, but it did. Maybe I should stand for incredible, since some letters are not delivered even with the correct address and postage. To see other stamp-related Is, head over to the links at Sunday Stamps. This is a great find for i. Thanks for pointing that out - fixed! Love the stamp and glad you got away with it. It is a very cheerful stamp. Thanks. I agree, a nice little stamp. It's even nicely postmarked and the price was still not caught! Well that sure brought sunshine into your day. A double winner. A good idea to choose this mail related word! Here in NL Dutch PostNL delivers mail despite of insufficient poatsge, but also sends a kind of fine / pay-request note to the sender (if the address is on the mail, otherwise they send it to the recipient). I've received a few of these notes, not because of insufficient postage, but because in some cases the checking person didn't find the coloured stamps on the colourful enevelope, and in other cases the post person didn't recignize the stamp being for international mail and thought it for national mail. In all cases I spent a postage stamp to write them a letter (email address alas not provided on these notes), to which I received a 'sorry we were wrong' letter (and in two cases some nice stamp as an extra). Here the post office holds the item with insufficient postage, and sends you a postcard to let you know. It is not very convenient, as many local post offices have unhelpful business hours. And the last time this happened to me, the clerk gave me the wrong item after I paid the shortage !! Nice that PostNL sometimes compensates for their error.